How would you explain to a committed life long vegetarian that the same quality rib-eye cooked medium rare or well done tastes different? They’d understandably insist that you have to describe the difference and explain why it is so, but one would find it far simpler and more convincing to get them to taste. All steak lovers are convinced of the difference, because the experience sells itself, yet how many could convincingly state what is different and why the cooking time plays such a pivotal role? The majority of wine drinkers pay little attention to the vessel from which they drink, yet they will quickly send back a dish in a restaurant if not cooked to their liking. Goblets, jam jars, plastic cups, mugs can all be used to drink from but accepting them is no different to accepting that food is only fuel. There is a wide spectrum of engagement ranging from those who believe food is just fuel, to those who have a secret family recipe for Jerk marinade or sushi rice. The same spectrum exists among the wine consumer, from the £5.99 bottle per week in the supermarket shopper to the natural wine evangelist. From those who will drink from a jam jar to the wine glass collector, who has a different shape for each wine. The same engagement range can be applied to coffee, tea, chocolate and even denim jeans. When discussing why some people become obsessed and others couldn’t care less, it is often said that while food is essential, the other categories are not. But if survival were the only criteria, then secret Jerk sauces would not exist. One important element to devoting time, effort and funds to an obsession, is allowing oneself to be selfish. We grow up being taught not to be selfish, to think of others and in fact, when applied to wine or indeed coffee, by being selfish we can then share and give enjoyment to others. Being self-indulgent gives validity to selfishness, where in the end one should get better value for money, better quality, a better experience. It is said that we have five senses yet it could be argued that we have six. The sixth is flavour, which is a combination of smell and taste but is neither separately. We perceive ‘taste’ using our tongue and ‘smell’ from aroma entering our nose. The tongue is a fairly blunt instrument, when compared to the nose, sensing five tastes of which only three are relevant to wine; sugar, acid and bitterness. ‘Flavour’ is perceived from the aroma of food or drink flowing up the nasopharynx at the back of the mouth above the tongue, past the olfactory receptors and exiting the nose. No one would say that smell ‘is’ flavour and with wine, we often comment how ‘on the nose’ the wine is different to ‘in the mouth’. An article on the BBC’s website discuses this, especially in relation to sweetness. Different wine glass bowl shapes change how we perceive flavour by altering the speed and concentration at which our nasal receptors receive the aroma (vapours) of wine. A camera has recently been developed in Japan, which can photograph wine vapours and it shows this. There are many different molecules evaporating from the surface of the wine and it is the head space above the liquid in the glass where flavour resides. This is why the widest part of an ideal wine glass should be about a quarter to a third of the way up, which is also the ideal fill level. Above the widest point, the glass should taper in, trapping the aroma. Over filling a glass reduces an individual’s ability to perceive flavour. Glasses which are widest at the opening, not only imply the fill level is to the top, they cannot contain the aromas to then deliver them to the mouth and nose. It has been said that the shape of the wine glass bowl changes the way that the liquid enters our mouth and is distributed onto the tongue, but with normal drinking it is not possible to pour wine onto one part of the tongue. The idea of a ‘tongue map’ was taught in schools to explain how the tongue detects different tastes on different parts of the tongue, but this has been completely disproved by science. 3. Simple, young, unwooded, White wine, usually single variety. 4. Complex, aged, barrel fermented, aromatic, often blended White wine. 5. Sparkling. NOT a narrow straight flute nor a flat open coupe. 6. Sweet and or Fortified. 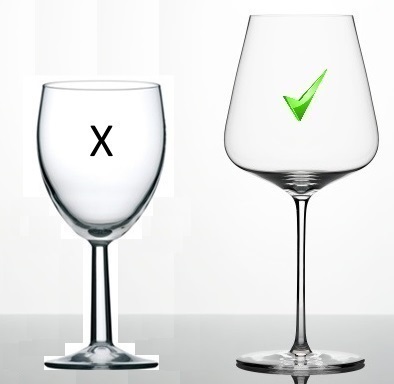 Every single different wine glass shape on the market will change the flavour of the same wine. The smallest change in shape alters the flavour. Some shapes are vastly superior to others at delivering flavour. The wine glass shape is not the only factor affecting the perception of flavour. The shape is the only element which impacts the nose but the weight of the glass will change how the wine is perceived. In his book The Perfect Meal author Charles Spence discusses many aspects of dining and one of the most relevant chapters to wine glasses concerns the weight of cutlery. Studies have shown that the diner perceives the meal to be finer if the cutlery is heavy. The opposite is true of the wine glass. A featherweight glass disappears during drinking, freeing the drinker to focus almost subconsciously on the flavour. A heavy glass immediately draws one’s attention to the weight of the glass as opposed to its contents. The condition of the drinker themselves plays a key role in the perception of flavour. The individual’s mood, level of hydration, having eaten or not, the company kept, ambiance, weather and drinking leisurely vs snapshot tasting will all influence effect and enjoyment. Some are within our control, others not. The ancient Greek philosopher Epicurus said in 300BC, that to be truly happy, one needs freedom, food (+wine) and friends. If Zalto were a 2320 year old company, who knows what else he may have included in his philosophy.